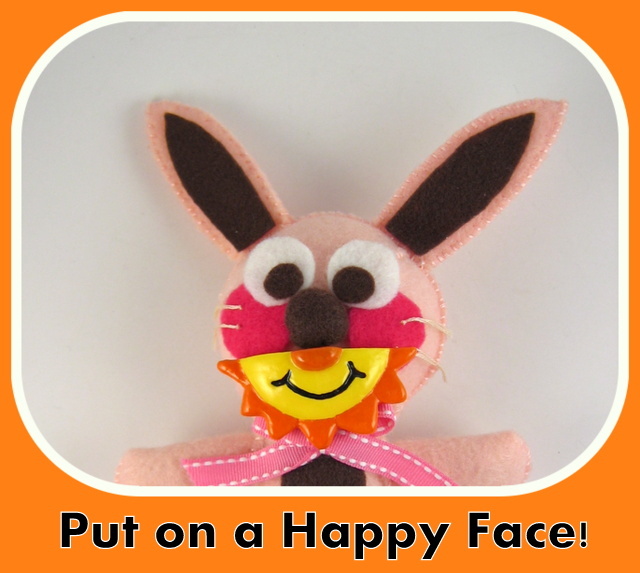 Hey, it’s me Ralphie wearing a “happy face”! 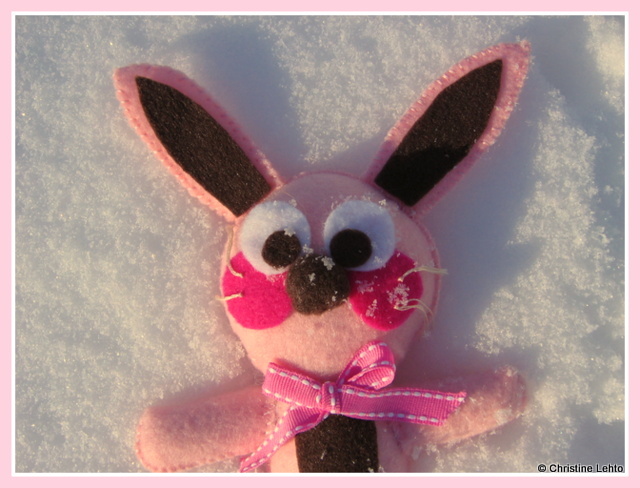 I’m here to show you some brand new magnet designs created by Christine. 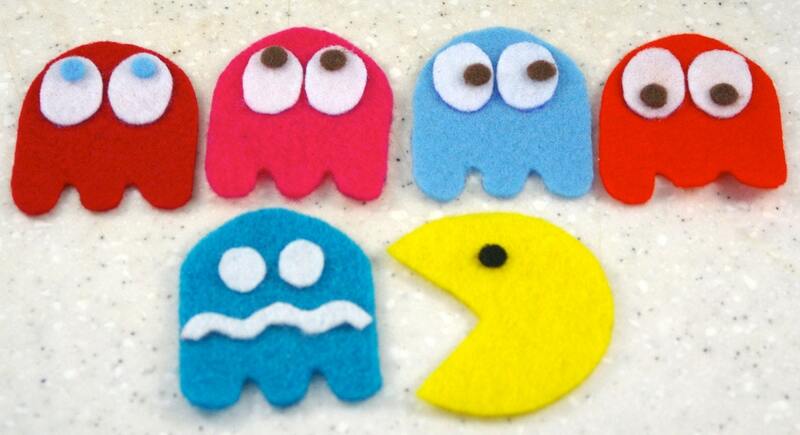 They are cute and clever fridge magnets that I’m sure you will enjoy. 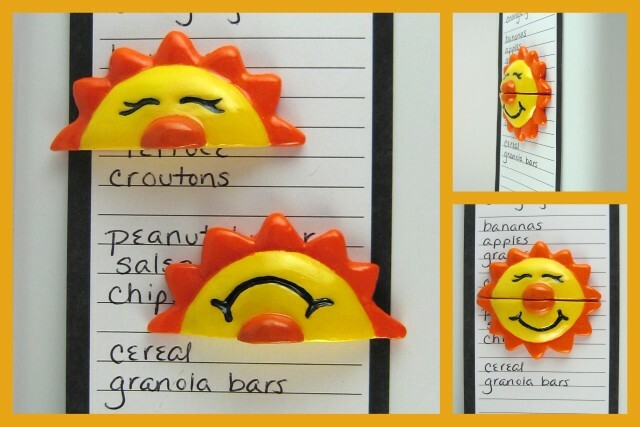 First I will show you a happy sun face fridge magnet that comes in two separate halves. You can show off your sunny side whether it is up or down. Are you feeling “sunny side up” or “sunny side down”? Maybe you have a sunny disposition and you prefer to keep a sunny side up attitude. 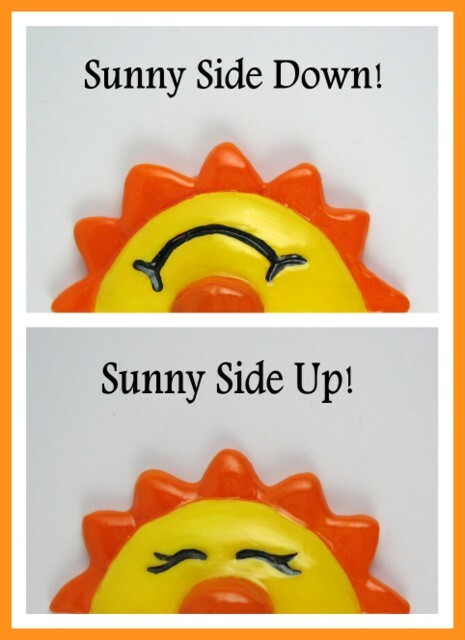 Then the “sunny side up” half would be a good fit to show off your happy outlook. If you have a sunny side down disposition, then the bottom half of the sun is for you. And maybe, just maybe the bright, beaming upside down smile on the bottom half will transform you into a sunny side up person. If that’s the case, you may want to have both sunny side halves to display on your fridge or magnetic board. Wouldn’t these make a wonderful gift to brighten someone’s day? 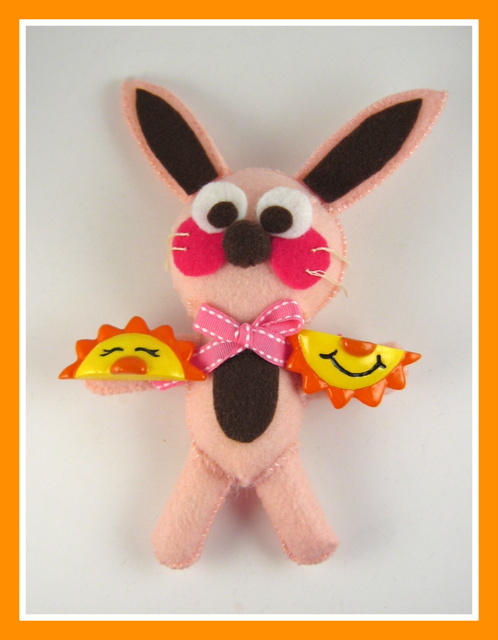 At Christine’s Etsy shop, Lilly Bug Boutique, you can select either the top half or bottom half of the sun to suit your mood or personality or of the gift recipient. Christine enjoys creating an interactive relationship with her customers where they can select a piece whether it be in a style like “sunny side up/down” or a selection of colors. This brings me to the next new fridge magnet design to show you. 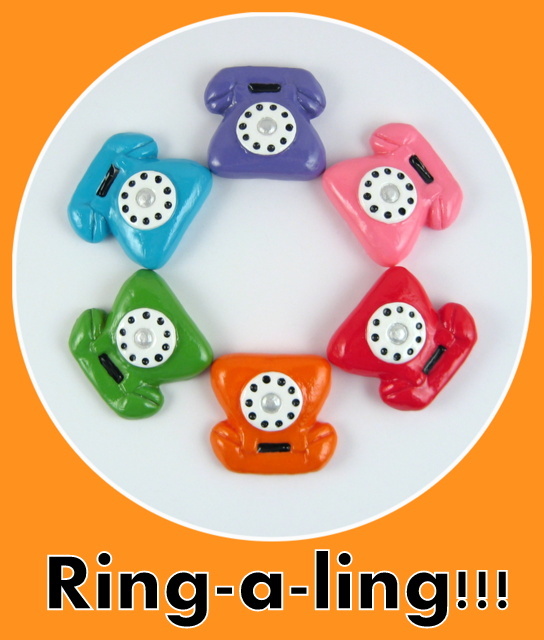 The retro rotary phone magnet comes in six vibrant colors. And if there is color you’d like but don’t see, please be sure to ask Christine about making one in a different color for you. She loves to hear from you. The retro rotary telephone is becoming a rare sight just as pay phones have disappeared with the advance in technology like cell phones. When’s the last time you have seen a pay phone or a rotary phone? 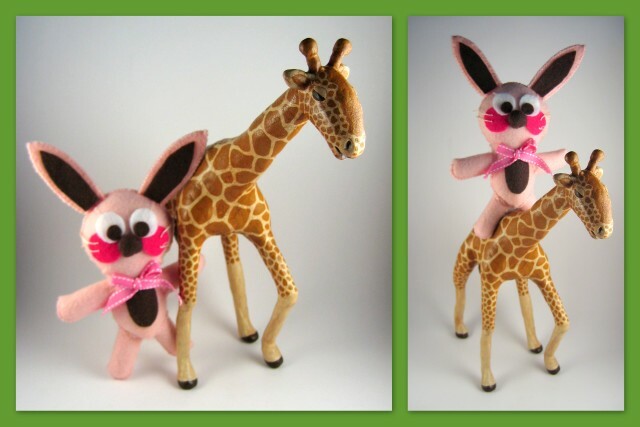 A giraffe sculpture created by Christine! 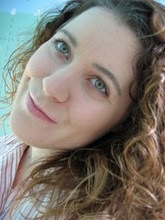 Hello folks, it’s long overdue for an update from Christine’s studio. This last Christmas season, Christine sculpted this fine giraffe sculpture for a friend to give to her niece for Christmas. 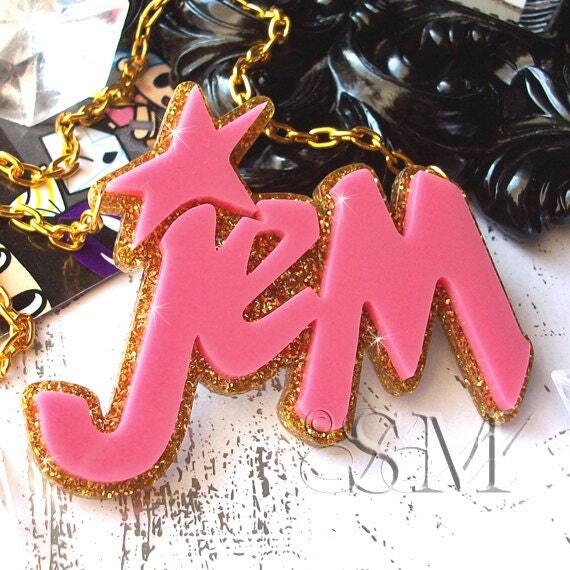 I’m here to give you an little look into how this piece was sculpted and hand-painted. In the photos above you can see how the giraffe sculpture began as some foam pieces, wire and foil. First Christine used some foam balls, wire and secured them together with some Apoxie Sculpt. Then she added some wire legs and secured those with Apoxie. After that she filled in some of the body mass with aluminum foil and masking tape. Once she had most of the giraffe body shaped with the foil, she started to sculpt over the surface with Apoxie sculpt. After the body was done being sculpted, Christine started to paint the giraffe and all of those lovely spots. What a task to be done! Here you can see the progression of all of the spots that were carefully and painstakingly added to the giraffe’s body. Can you count how many spots it has? A completed giraffe sculpture with a crackle finish! Are you seeing spots now? I think Christine must have been seeing spots after hand-painting each and every spot on the giraffe. She loved creating the giraffe and the challenge of making it. As a final touch, Christine added some One Step Crackle medium and gel stain to give the giraffe a warmer tone. How do you like her giraffe sculpture? 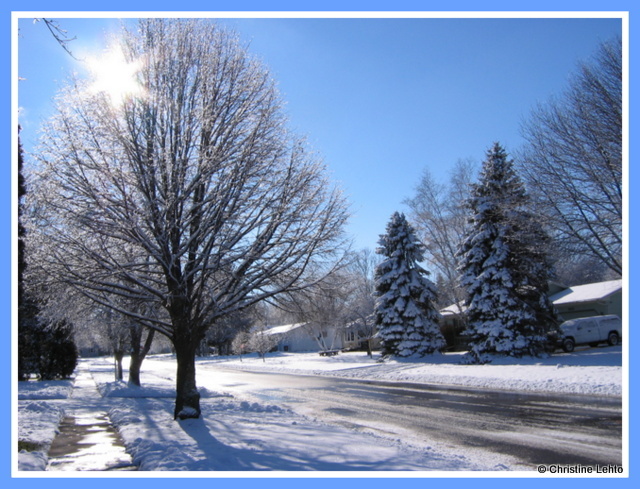 Ahhhh….the pretty, sparkly winter snow! 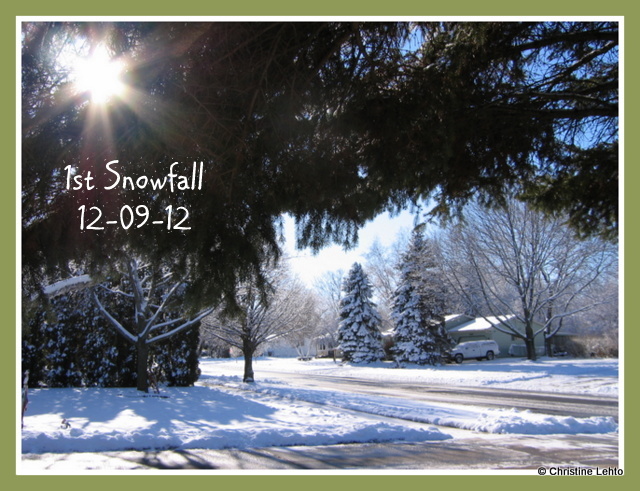 About a week ago, we had our first snowfall for the season here in Wisconsin. Christine and I decided to venture outside the day after it snowed to take in the beauty of the snowy scenery in the bright sunshine. Look at the pretty fluffy white snow covering all of the branches. It was cold outside but the sunshine was starting to melt the winter snow outside. 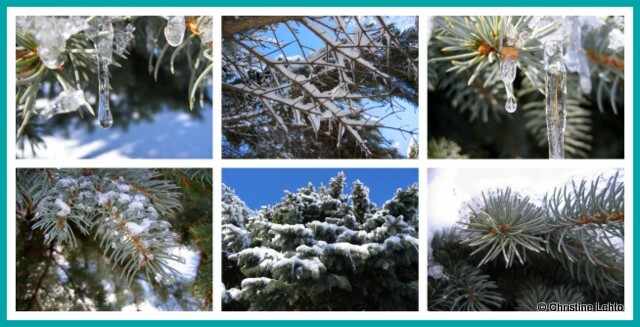 Do you see the drip-drop forming at the tip of one of the branches in the photo collage above? I tried to make some snow angels in the freshly fallen snow. In the process I managed to get snowflakes all over my face too. Brrrrrrr……..!!!! Sigh….after making snow angels we went under the deck to rest for awhile. There were some pretty snow covered rocks under the deck. Don’t they look like they are frosted with icing? 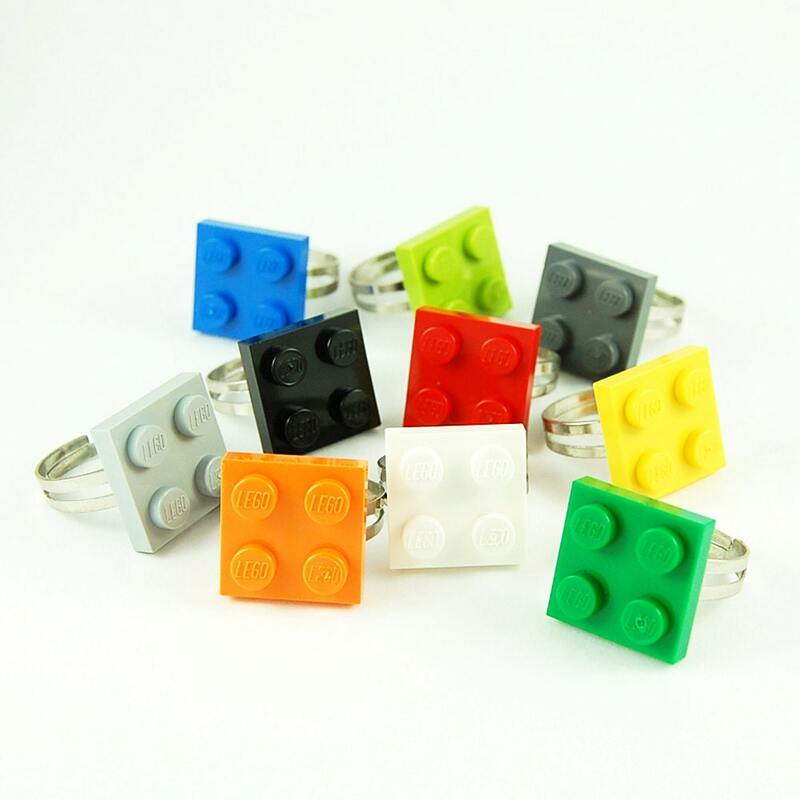 However, I would not want to take a bite out of those, ouch….that would hurt! After our rest under the deck, we continued on with our winter snow exploration. Next, we came across trees filled with icicles. Some of the icicles were forming right before our eyes as we saw them drip, drip, drip from the tips of the trees. It was a pretty sight! Christine tried to observe each and every icicle that she could and tried her best to capture the moment with her camera. Can you spot the photo with an icicle that resembles the Virgin Mary and an ice crystal that looks like a butterfly? 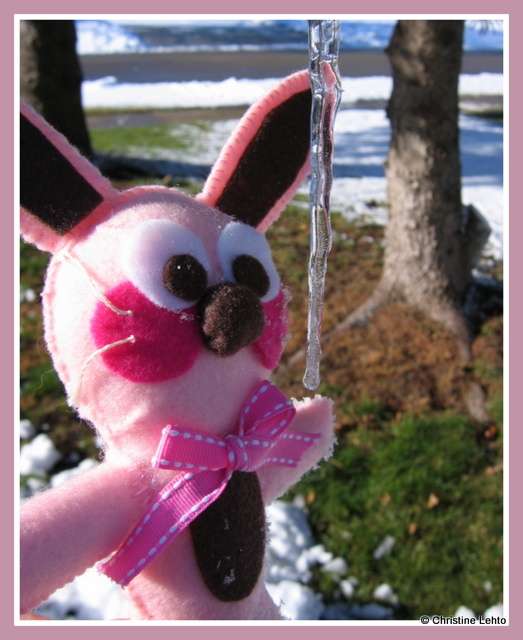 One of Christine’s friends on Facebook shared his keen icicle observations and found those images in the ice. I was going to try to taste one of the icicles, but unfortunately, since I’m made with felt and don’t have a tongue I could not attempt to do it. Also, Christine cautioned me about doing that anyway. We had a fun time exploring and we hope that you enjoyed learning about our adventure in the winter snow! All of that snow has already melted away, but this week we are expecting a big snowstorm on Thursday. Hmmmmm…..maybe we can venture outdoors once again in the snow. As I close this post, I’d like to share one more photo with you that Christine took. She took it while standing under the icicle covered trees. Enjoy! Here’s a penguin sculpture that Christine created for a local hair salon named “Twist n Tease.” In the photo above I, Ralphie the bunny, am standing next to the penguin just prior to it getting coated with gesso as a primer coat. 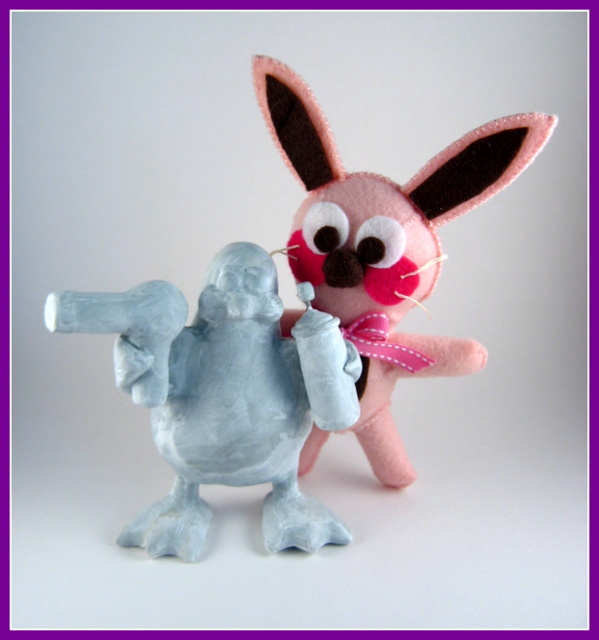 The color of the penguin in the photo is the color of the Apoxie Sculpt that she uses to sculpt her penguins with. Do you know what is under the layer of Apoxie Sculpt? It’s a burned out light bulb that Christine up-cycled into an armature for her penguin sculpture. She has created a variety of sculptures using light bulbs as a way to reuse them. “Boo!” says the ghost penguin. No, it’s not really a ghost right now. It is just coated with gesso to prep the surface for painting. Next Christine will paint the sculpture and bring it to life. 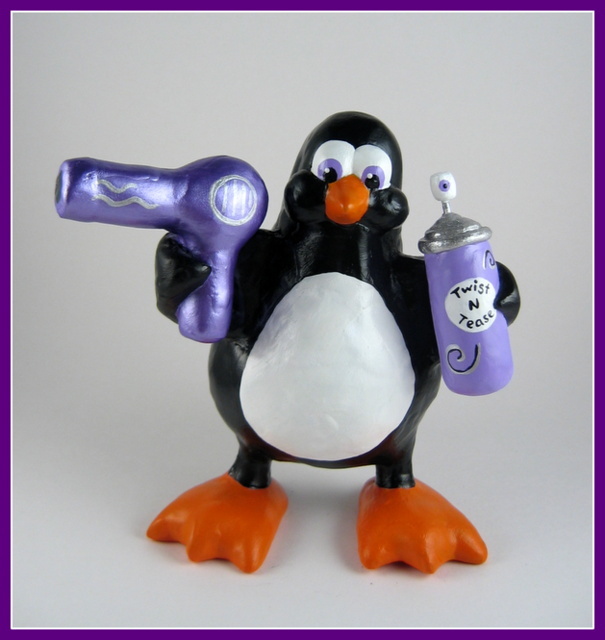 Now the penguin is painted in living color and full of his very own personality. It looks he is ready to give you a new hair-do. He is armed with his purple hairdryer and trusty can of “Twist n Tease” hairspray. What type of hairstyle are looking for? Here I am with the hair stylist penguin just before he left for his new home at “Twist n Tease” salon. He will see many hairstyles when he’s at the salon. If only I had hair for him to style, then I could see him again and he could fix my hair. 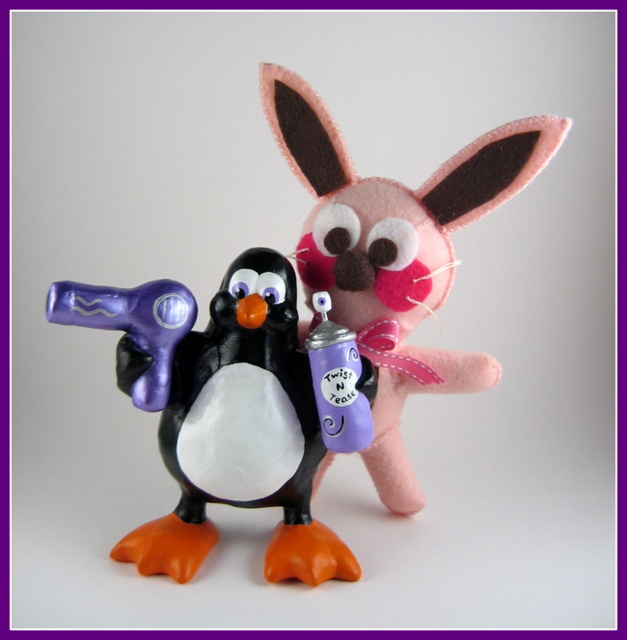 Sigh….what a contradiction to be a “hare” without “hair.” I hope you enjoyed seeing the hairdresser penguin. Don’t forget to stop by for a visit again. 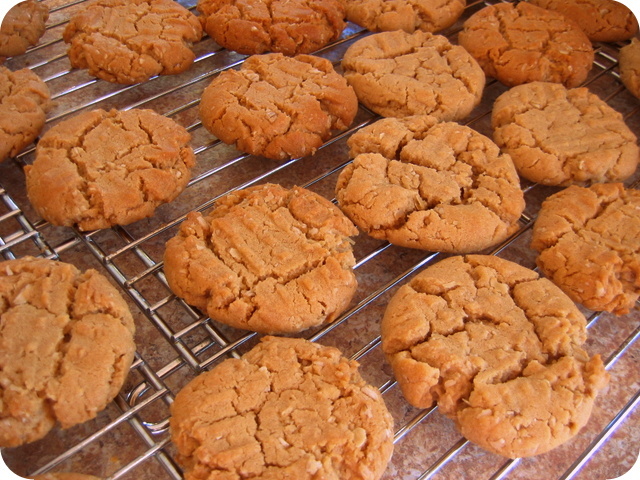 A peanut butter cookie recipe to warm up the cool, crisp fall temperatures! Fresh baked peanut butter cookies anyone? 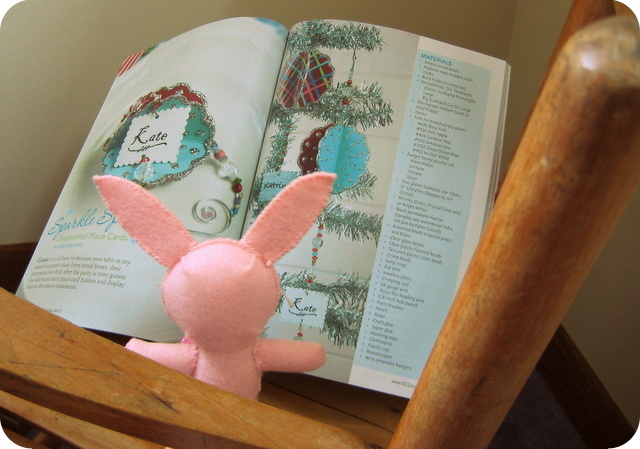 Mmmmmm………today I, Ralphie the bunny, will share a cookie recipe, which is one of Christine’s favorites. With the cooler temps setting in during autumn, she thought that making some homemade cookies sounded like a good idea. Without further delay, I will now share the recipe with you. Don’t those cookies look scrumptious in the photo above? 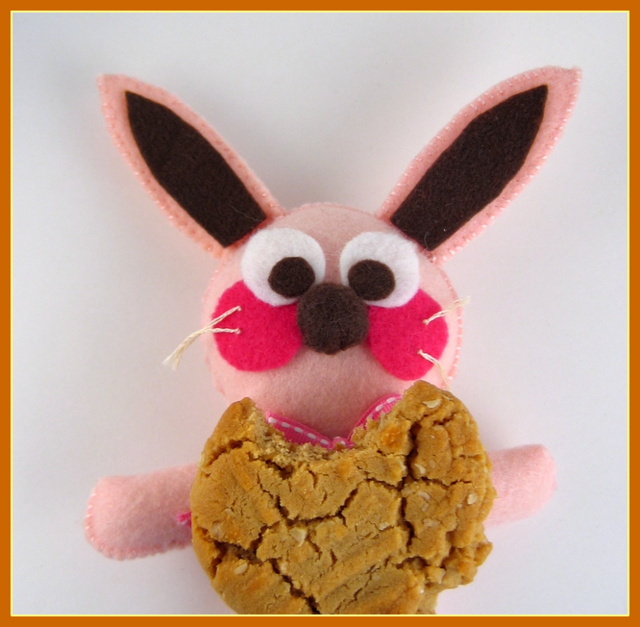 Yummmmm…..Peanut Butter Round-up cookies! Beat shortening and sugar together until creamy. Add eggs and peanut butter; beat well. Sift together flour, baking soda and salt. Add to creamed mixture; mix well. Stir in oats. Shape dough to form 1 inch balls. Place on ungreased cookie sheets. Press with fork to make flat. Bake at 325 degrees for 8-10 minutes. I had to “taste test” the cookies so I can give you a firsthand account of their goodness. Now I can tell you that this peanut butter cookie recipe is one that you will want to try out for yourself. Interested in more cookie recipes and learning some cookie facts? You can find some great cookie recipes at the site Popular Cookie Recipes. It’s an interesting and fun site to visit. You can take a cookie quiz to find out what kind of cookie you are. Christine took the quiz and she found out she was a Girl Scout cookie. Also, you can also learn about the history of the cookie. Did you know that cookies were originally used to test the oven temperature for baking cakes? Learn more about the world of cookies there. I hope you enjoy the recipe and try it out. You won’t be disappointed. 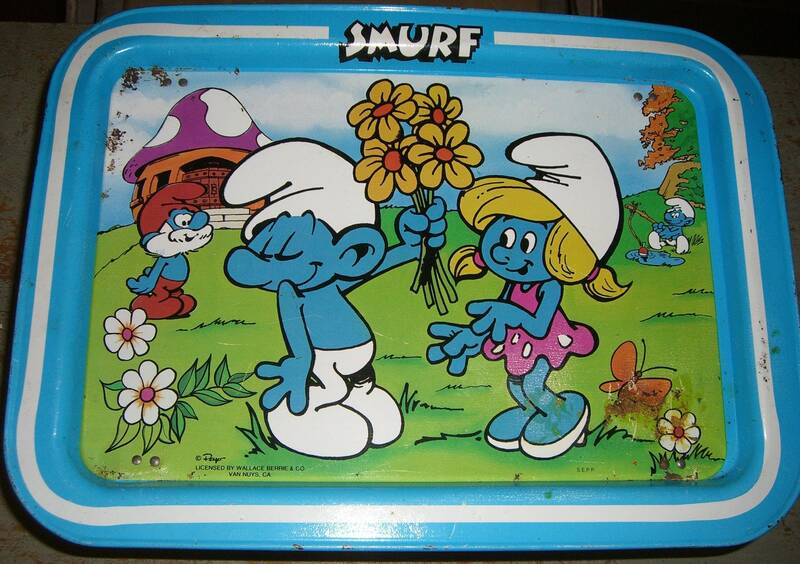 80s memories! 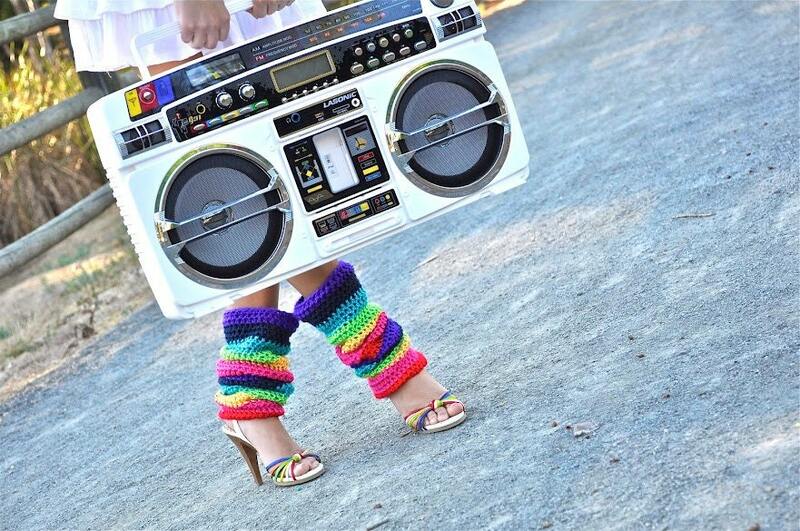 What comes to mind when you think of the eighties? Maybe the Rubik’s Cube, Strawberry Shortcake or the Care Bears? One of my sisters loved playing the Rubik’s Cube and she got really good at it. 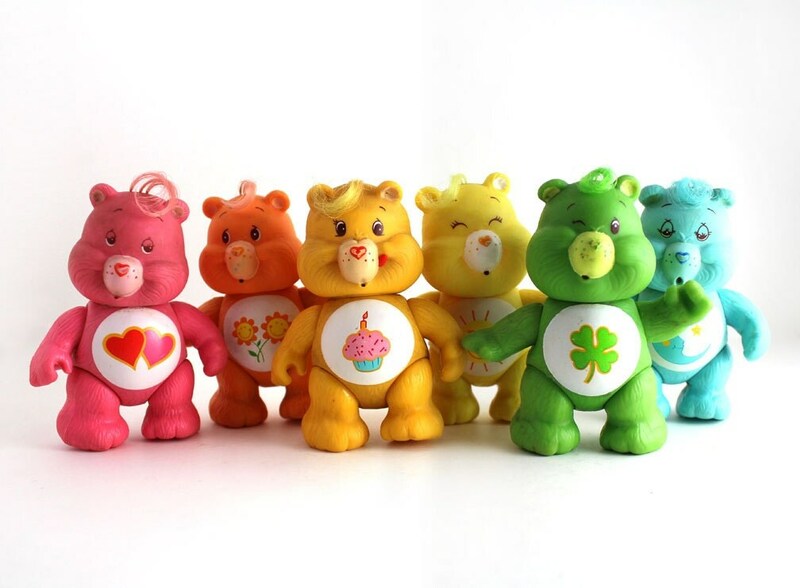 I never ever got a Care Bear, but I always wanted one, especially the one with the rainbow on its tummy. 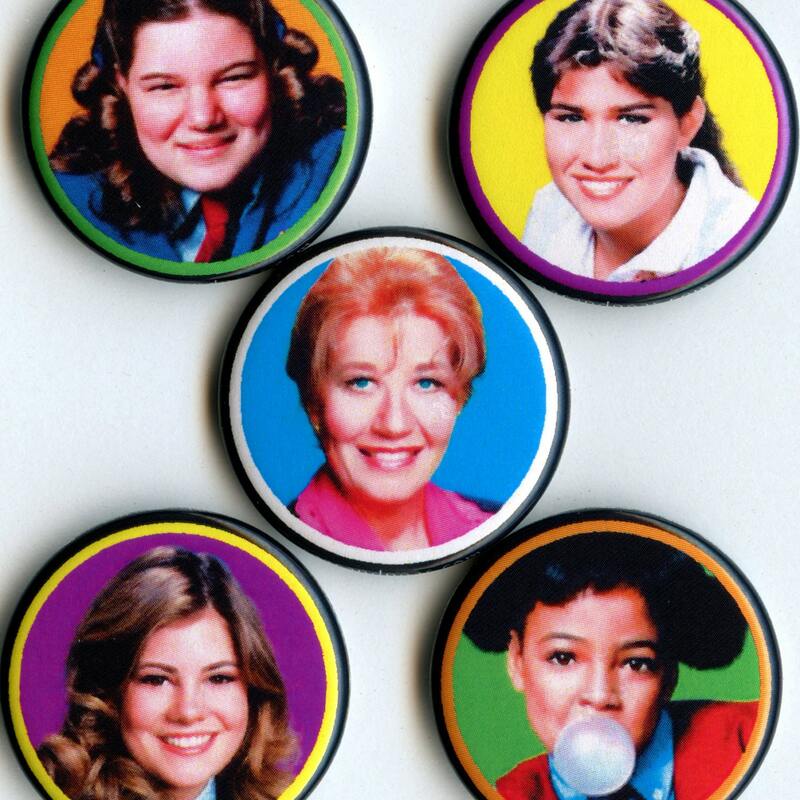 Those memories from my youth were alive today while I curated an 80s memories treasury on Etsy. As I said, I never got a Care Bear, but I did have a Strawberry Shortcake doll. 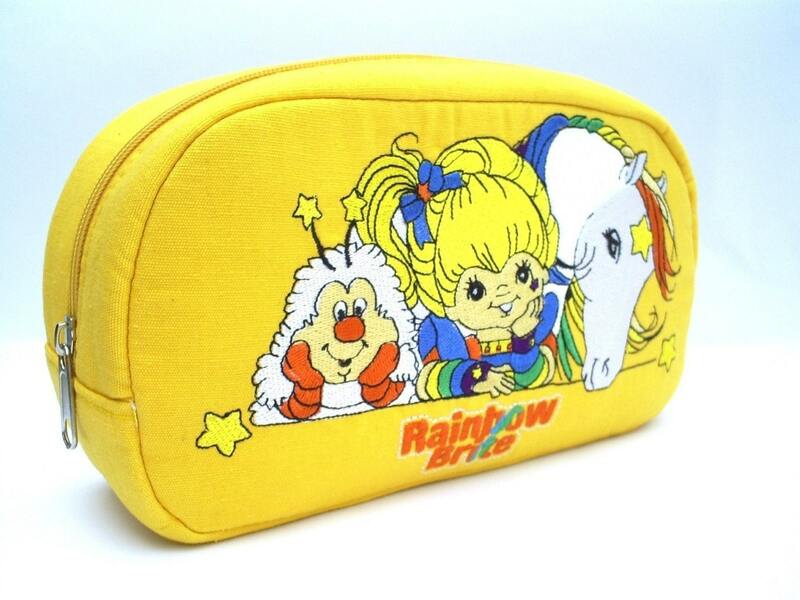 Some other Strawberry Shortcake items I had were a hairbrush, comb, lunchbox, and silverware. And I also had a Strawberry Shortcake exercise vinyl record. She and her friends did exercises on the record and there was a chart to see how to do the exercises. 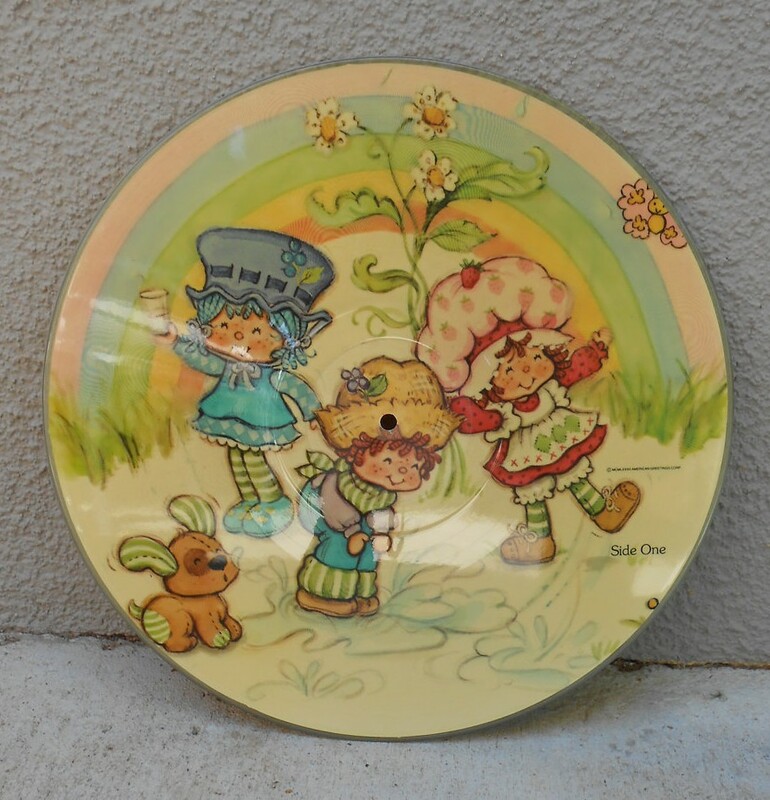 Another Strawberry Shortcake record I had was one that had a picture embedded on both sides of the record. I loved that record, it was totally awesome! I think I still have that record somewhere in storage. Today I found a photo of that awesome Strawberry Shortcake record online. 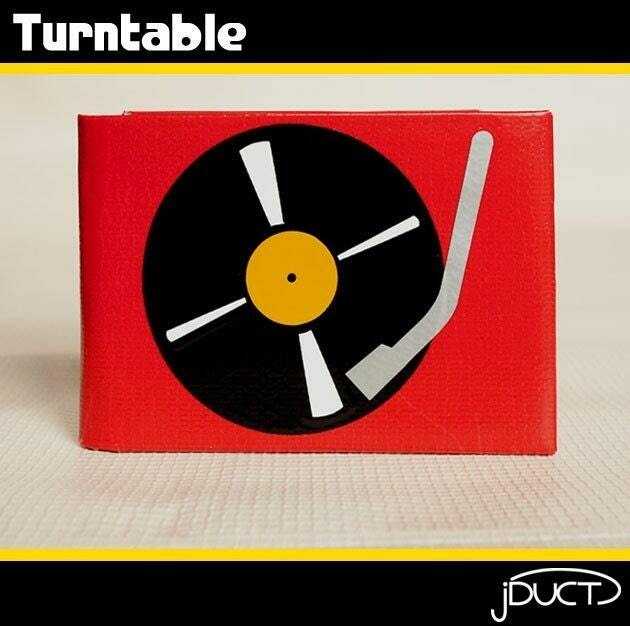 The record from my childhood looks like the one shown below. 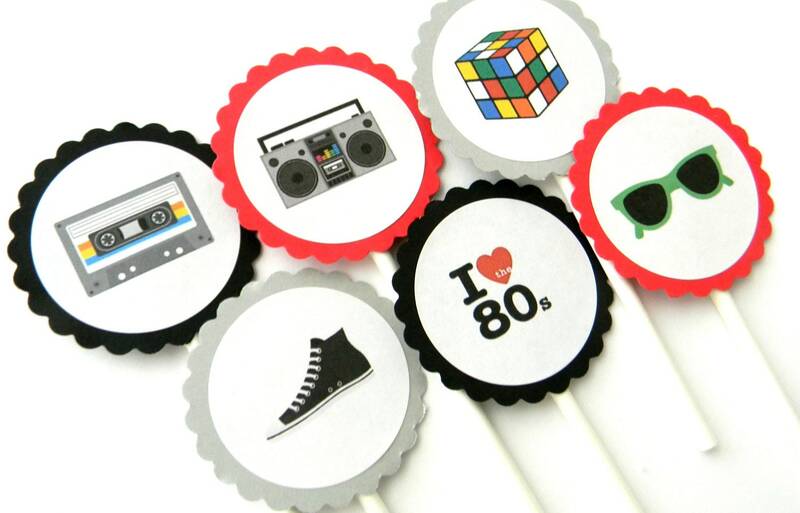 What items did you have from the 80s? 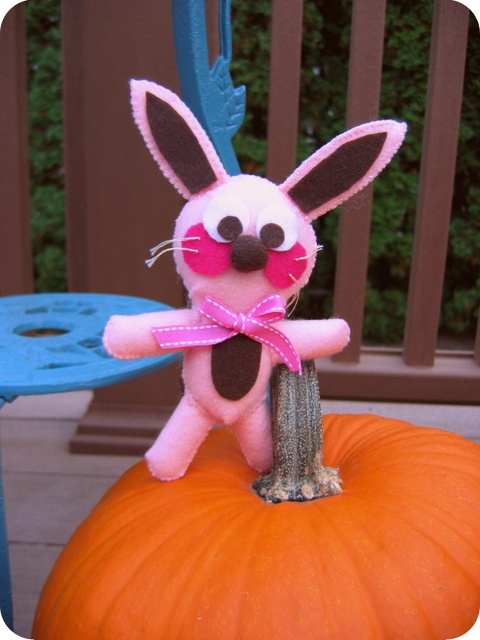 Ralphie the Bunny here. 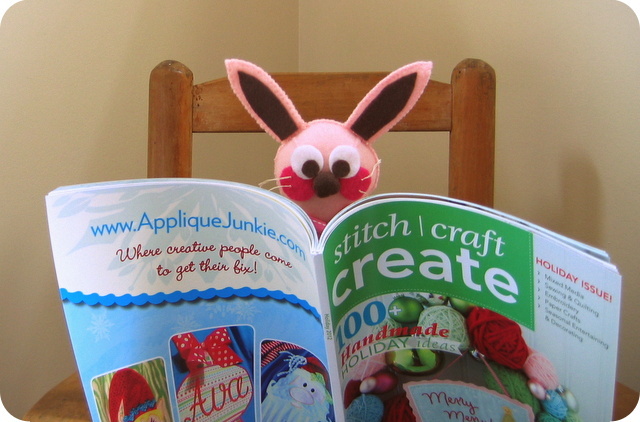 I’m busy reading an article in a craft magazine. 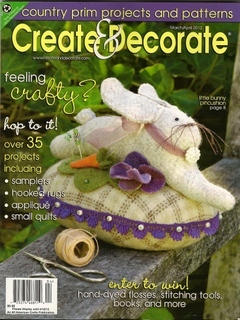 It’s an article that Christine wrote for Stitch Craft Create. 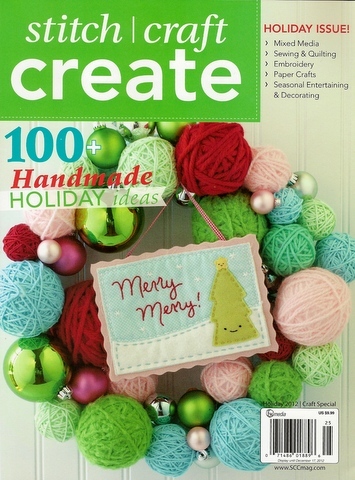 Her glitter ornaments, “Sparkle Spheres,” are featured on p. 54 in the Holiday 2012 issue of Stitch Craft Create magazine. She created these pretty pieces using empty cereal boxes. Christine enjoys finding uses for items often deemed as “useless.” She decided to make some delightful ornaments with the cereal box material that she saves for her paper crafting/mixed media projects. It’s a wonderful way to create something lovely from a material that many people throw out in the garbage. 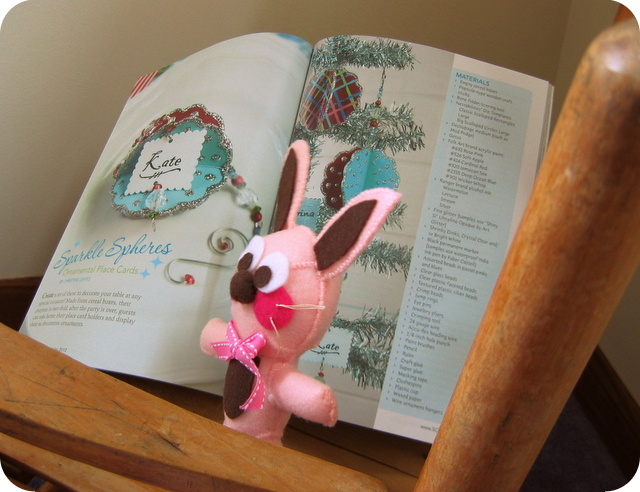 Here’s a little peek at her article in Stitch Craft Create. 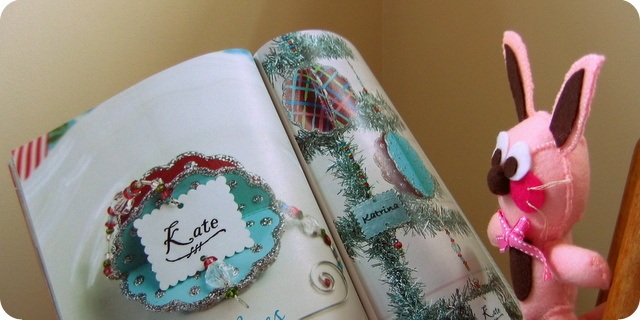 In the article you can learn how to make your own glitter ornaments. 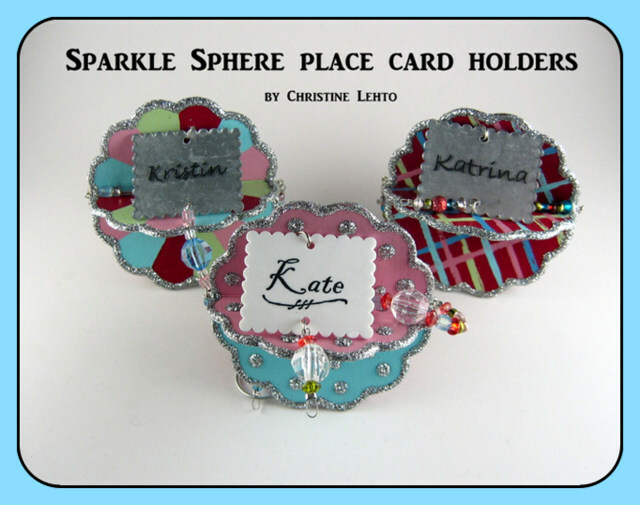 Something special about them is how you can use the “Sparkle Spheres” as place card holders for a holiday party. Then your guests can take them home to have as a special keepsake from your get together. 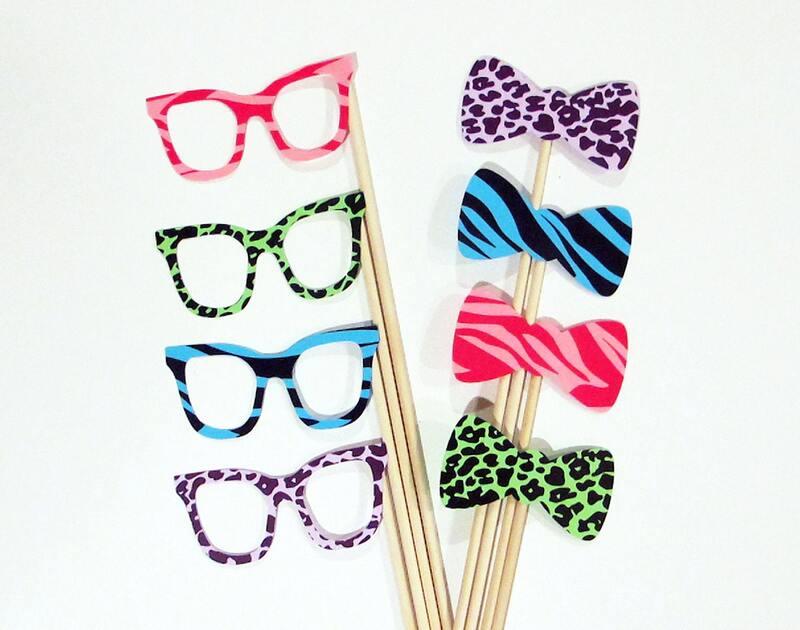 They can use them as a decorative ornament in their home to remind them of the warm memories at your party. Look at how sparkly they are. 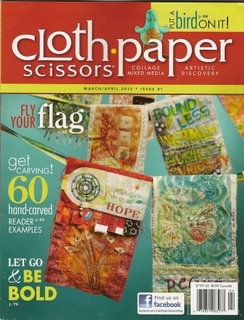 Don’t you want to get your hands on an issue so you can learn how to make them? I’m about to get up and start my own set of “Sparkle Spheres.” Start saving your empty cereal boxes, cracker boxes, etc and you will be ready to make your own special ornaments for the Christmas season as gifts and/or for your party decor. Enjoy! Cute fridge magnets? Ralphie, where are the new magnets? I am here to help answer that question. Do you see me in the photo? 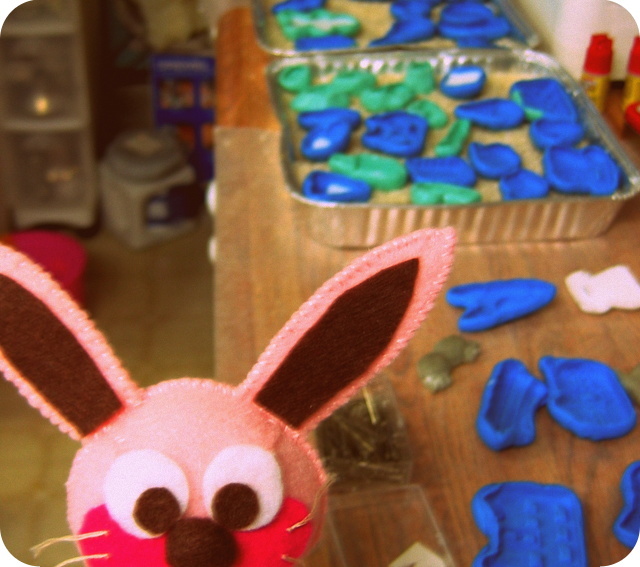 There I am popping up in front of a whole new assortment of silicone molds used for Christine’s cute fridge magnets. 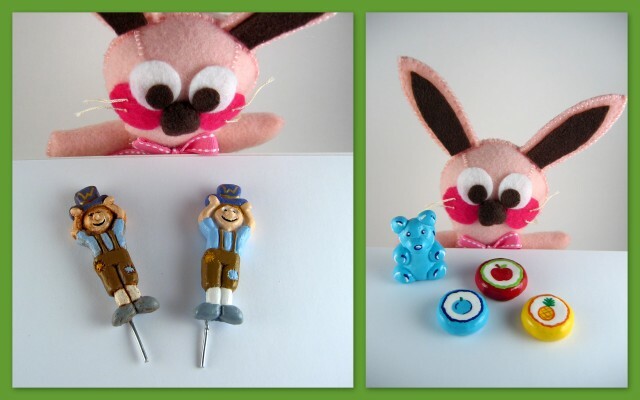 She has been working on many new pieces including a set of the characters from the original Willy Wonka movie. 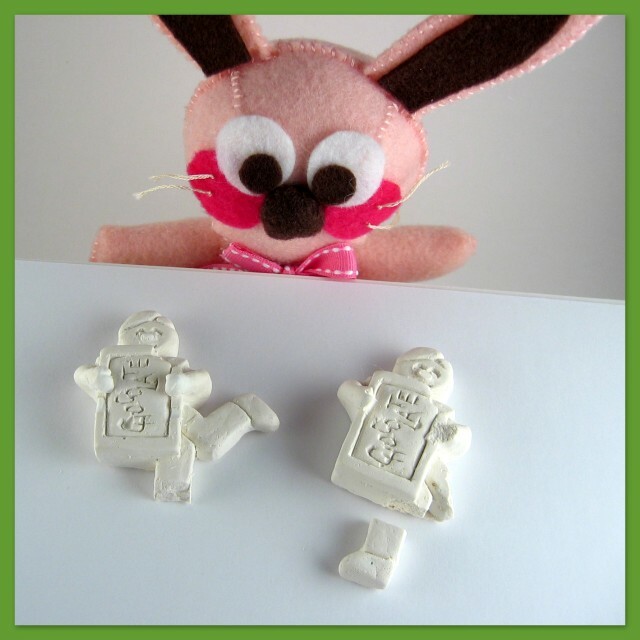 After she made her Willy Wonka characters in her “Pure Imagination” piece for the Mystery Build 2012 Challenge, she decided to make them as fridge magnets too. Here are a few of Christine’s new magnet pieces that are almost done in the painting department, waiting to be sent to the glazing department. Hmmmm……let’s see what cute fridge magnets are there? I see a couple of pieces that look like they could be cassette tapes, a new ice cream cone design, a slice of rainbow layer cake……. 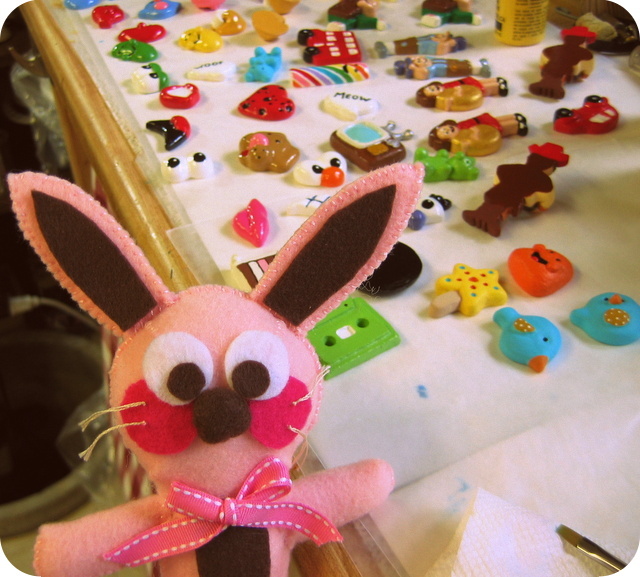 Look at all of the new and brightly hand-painted cute fridge magnet designs that Christine has been working on. 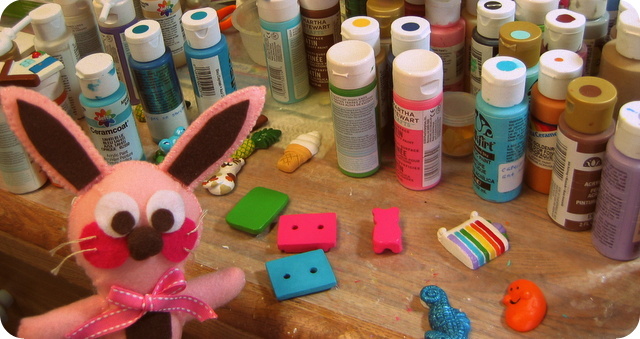 What do you see in her new magnet collection? This is just a sampling of some of her new pieces. There are more new magnet designs that did not make it into the photo. Plus, she still has many more new ideas for magnets, but she is trying to remember to pace herself. Also, if you have any ideas or suggestions to share with her, please let her know. She loves getting new ideas from others. 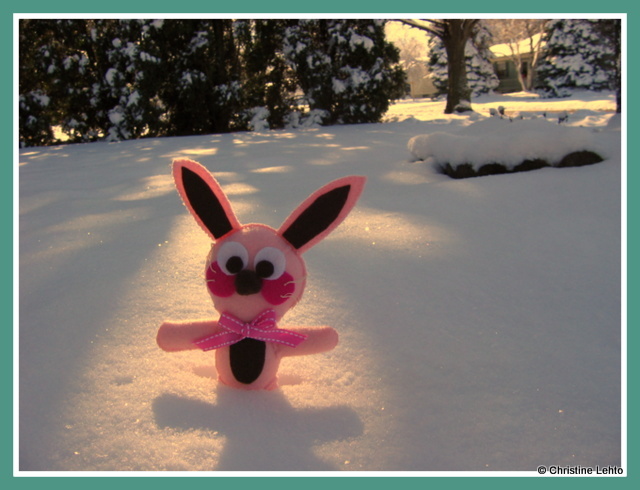 Stay tuned for more new pics of her new magnet designs and remember to stop by her Etsy store, Lilly Bug Boutique, to see her collection of cute fridge magnets. Voting is now closed. The Mystery Build site will announce the winners on Oct 19th. You can now go to the Mystery Build voting page and vote for your favorite piece. Voting ends on October 7th. There are 142 fabulous entries in this year’s challenge so the competition is stiff for the “People’s Choice” award. Anyone can vote for their favorite submission! The entry with the highest number of votes will win the People’s Choice Award of $1000! Voting is open until October 7th, 2012. Simply click the “Vote for this project” button below the entry. You may vote once per day. Multiple voters are not permitted to share the same IP address. Multiple daily votes from the same IP address or other fraudulent votes will not be counted, and the entry or entrant may be disqualified. A photo collage of my Willy Wonka inspired piece. It was a fun experience and a challenge in creativity. If you like my “Pure Imagination” piece, please stop by and vote. Thank you! The Mystery Build 2012 challenge was living up to its name as Christine experienced challenges while working with the plaster of paris. As you can see, I am standing next to the first two Augustus Gloop pieces that Christine cast in the molds. During the first attempt, she tried to carefully remove Augustus from the mold but one of his legs broke off. 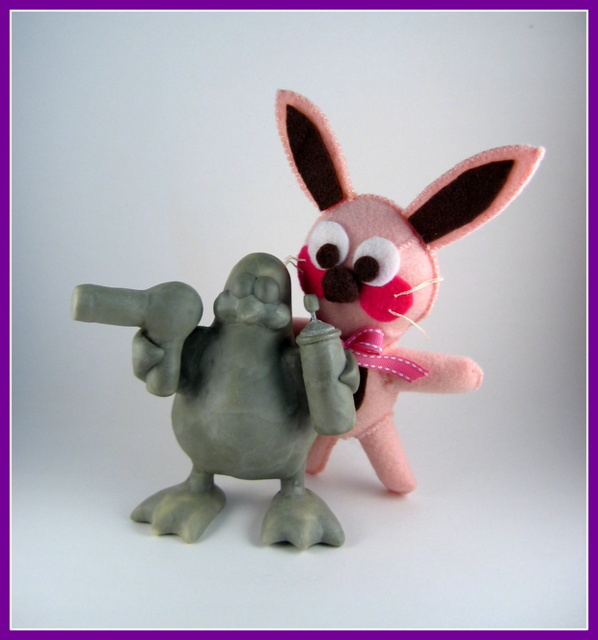 For the second attempt she managed to remove him from the mold without breaking the legs. However, when Christine tried to bend the wire embedded within the plaster near his foot, both of his legs broke. Yikes! Keep in mind that Christine only had a limited amount of plaster supplied in the kit, so she needed a good Augustus piece before she ran out of plaster. She realized that in order to get an undamaged Augustus, she would need to be sure that the plaster was completely dried before removing it from the mold. Also, she realized that she needed to rethink how to connect the pieces to the base with the wire from the kit. Since there was only school glue and one mini hot glue stick provided as adhesives in the kit, Christine needed to figure out a way to attach the characters to the golden ticket base. She decided to embed wire in the plaster of paris as the it hardened in the molds. Initially she wanted to bend the wire from the plaster pieces and secure the wire to the base. After her second Augustus Gloop flop, Christine knew that she did not want to risk bending the wire to attach the pieces to the base. She decided that the best way to attach them would be to drill holes in the base where the characters would stand. Then she could avoid having to bend the wire and insert the wire directly into the drilled holes. 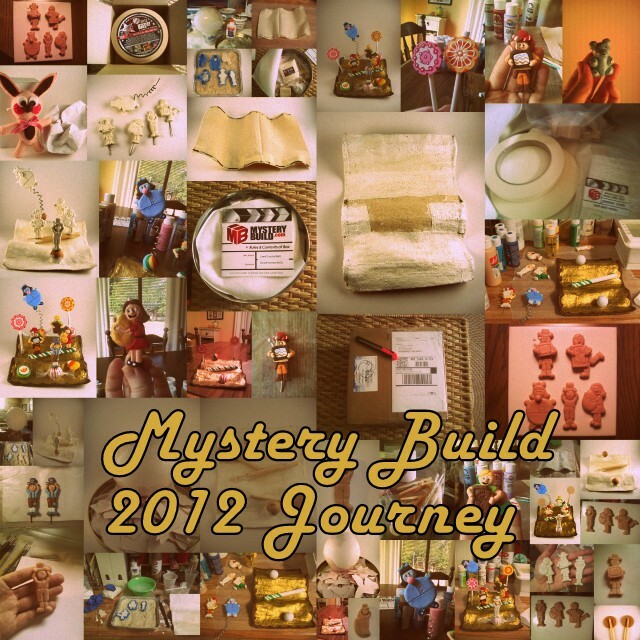 She also utilized the wooden pieces contained in the Mystery Build 2012 kit. Using the wooden pieces also aided in inserting the wires into the base because it gave Christine a more substantial foundation to drill the holes. The large dowel worked out perfectly for a large candy stick. The wooden balls worked well for pieces of candy. And the zip lock baggy material would be ideal wrappers for some of the candy pieces. 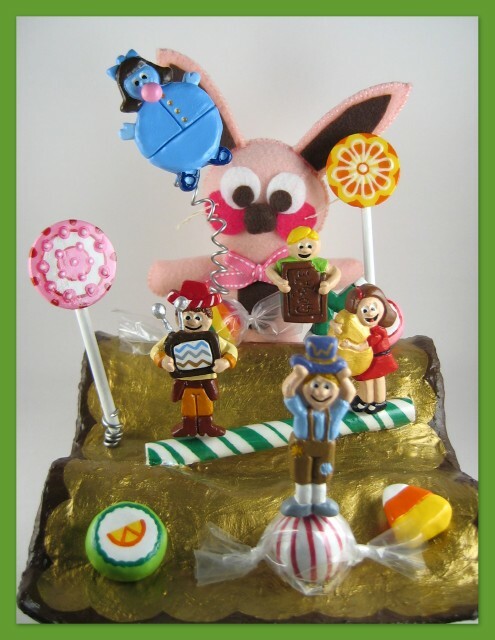 The mini wooden dowel and wooden circles attached together with some hot glue, ended up being some terrific lollipops to include in her sugary wonderland. After the holes were drilled into the base, Christine was able to place her plaster characters onto the golden ticket flying carpet. The wires remained unbent and were easy to insert into the drilled holes. Best of all, there was no damage to the any of the characters. Here’s how the piece progressed from a chalky white plaster surface to a full and vibrant array of colors. Did you notice the candy wrappers made with the baggies? There was a package of some air dry putty and two mini packs of air dry clay in the Mystery Build 2012 kit. 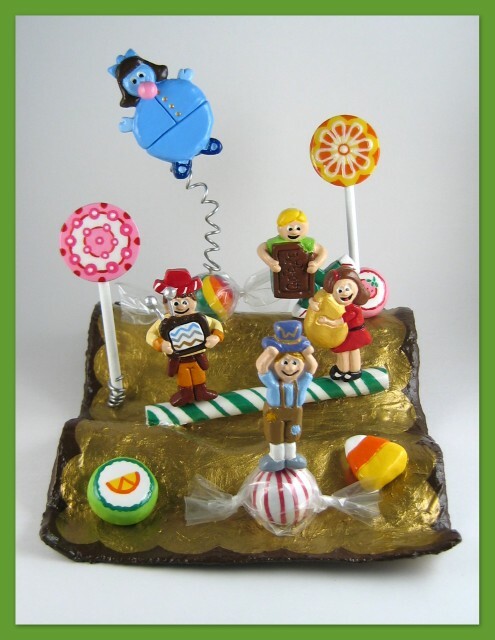 Christine decided to a create an assortment of candy pieces from the putty and clay. Then afterward she would decide which pieces to include on the final piece. The ones shown on the right hand side above were some extra pieces that she decided not to add to her final piece. On the left hand side of the photo, there are two versions of Charlie, one in an antiqued surface and the other in a regular surface. Christine had cast two Charlie pieces to test out if she wanted to use an antiqued surface on the Willy Wonka characters. Thankfully, even after making three separate Augustus pieces and two Charlie pieces, Christine ended up having some leftover plaster of paris. Phew, she didn’t run out! I, Ralphie the Bunny, had to pose with the memorable characters from Willy Wonka on Christine’s “Pure Imagination” piece. She named her piece after one of her favorite songs from the movie. Christine wanted to capture the feeling of “pure imagination” in her piece for the competition. Coming up soon, there will be voting open to the public for the People’s Choice award for the contest. I will let you know when the voting opens.